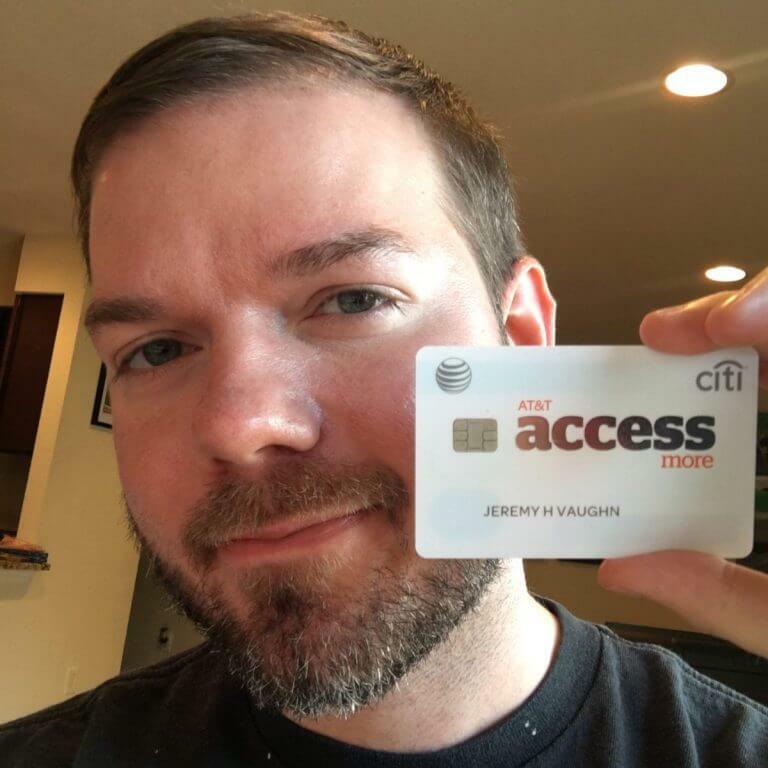 I asked Million Mile Secrets team members to share which credit cards are in their wallet. And to let us know if they plan to make any changes. We don’t reimburse writers for their credit card fees, so folks don’t have an incentive to pay unnecessary credit card fees. Harlan: I currently have 30 credit cards! The majority of them have annual fees. And I plan on keeping most of them! I’ll share my credit card strategy. And let you know which cards I’m keeping, converting, and canceling! 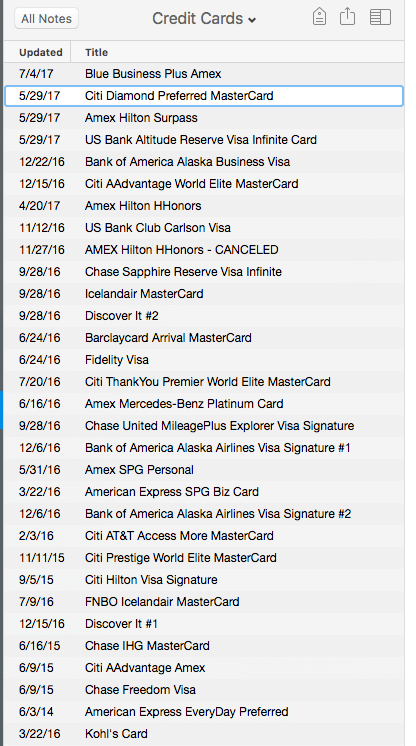 Here are the 30 credit cards I currently have and their annual fees. The 4th night free perk alone saved me over $3,000 last year! So I definitely hone in on how to get the most back from all my card perks. If you can’t tell, I do NOT qualify for most Chase cards because I open more than 5 new cards every 2 years. I do, however qualify for small business credit cards because I host on Airbnb. And many small business cards do NOT count toward Chase’s card limit! My Credit Score Is Nearly 800! Despite having so many credit cards, I maintain a great credit score. I pay my balances in full each month. And make sure to keep my oldest cards open to boost the average age of all my accounts. Here are the cards I’m keeping, converting, and canceling. This card is still fairly new. It had a sign-up bonus when it came out in May 2017. Currently, there’s NO sign-up bonus. But this card is still worth it because you earn 2X AMEX Membership Rewards points on your first $50,000 in purchases each year. And there’s no annual fee, so it’s a free way to keep your points active. Opening this card will NOT impact your chances of getting Chase cards in the future. That’s because AMEX small business cards do NOT show up on your personal credit report. And because I have other AMEX credit cards, I didn’t get a hard pull when I opened this card. I plan on keeping this one forever and using it for non-bonused spend, like dentist visits, pet care, repair services, and anything else that pops up without a category bonus! This one’s free to keep, too. Hilton is my preferred hotel chain. I find the points easy to earn and redeem. And they’re everywhere I want to be. I make a point to enjoy a meal and high-end cocktails before or after a flight at Dallas – Fort Worth. Plus, I get $200 in Uber credits each year. And $200 per calendar year toward travel incidentals with an airline of my choice (I picked Alaska Airlines). Between all these benefits, I feel like I get more than my money’s worth! 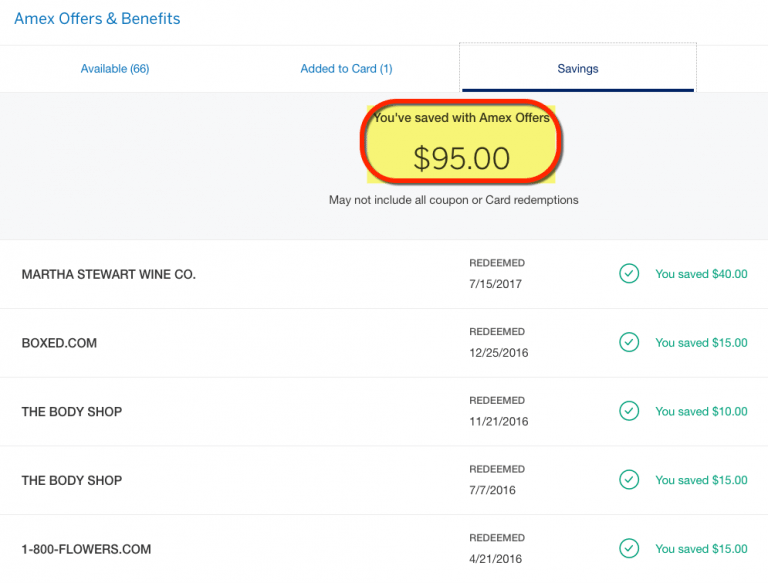 I keep this one for access to AMEX Offers – I save more than the $95 annual fee on this card. Plus, I get elite-qualifying stay credits each year just for having the card. But I mostly keep it for access to Sheraton Club Room lounges. 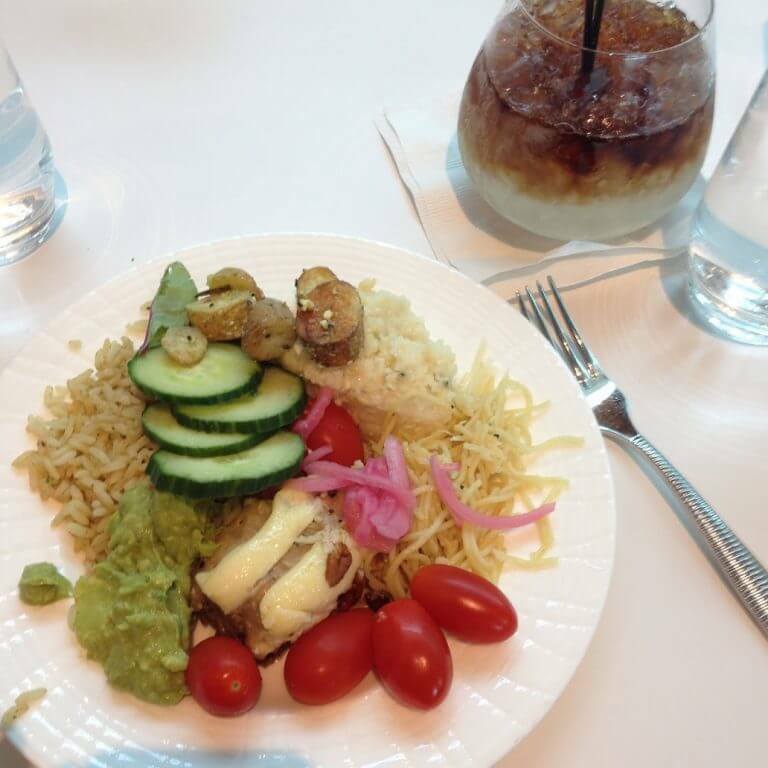 Sheraton Club Lounge Access (Like in Prague) Has Saved Me Hundreds of Dollars in Drinks and Snacks. And Has at Times Kept Me Alive Abroad! This perk is ONLY on the small business version of the card. And on its own, it’s saved me some serious cash. 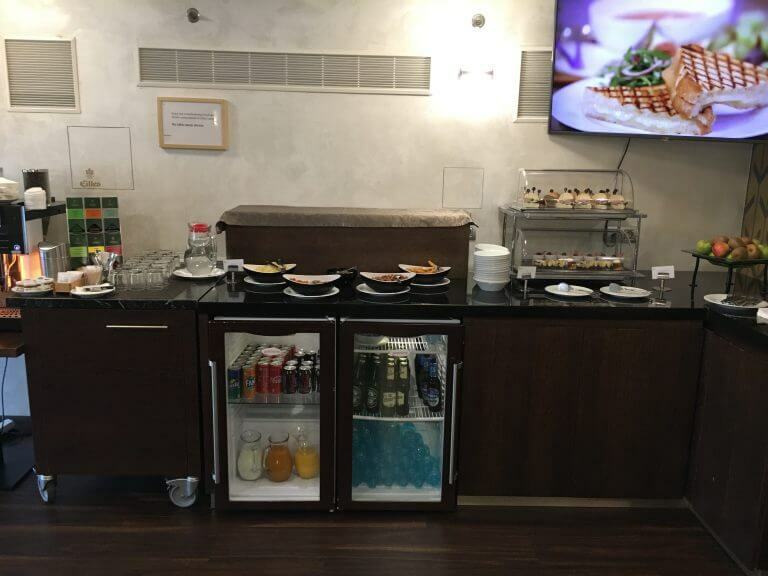 I snacked and drank for 3 days at the Sheraton Prague Charles Square. 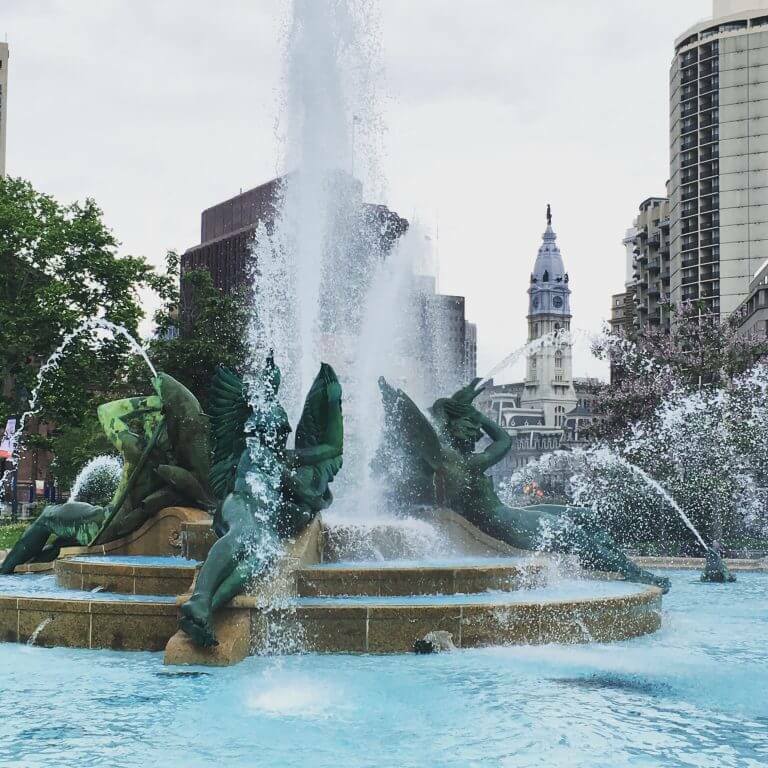 Plus, I used points earned from the card’s sign-up bonus to stay there – so it was all completely free! I downgraded to this card from the Barclaycard Arrival Plus World Elite Mastercard because it doesn’t have an annual fee (for the first year). And it kept my credit line and history intact. I place a small charge on it every once in a while to keep it active. But I don’t use this card for everyday spending. I opened a Chase student credit card in 2002 (my first year of college). 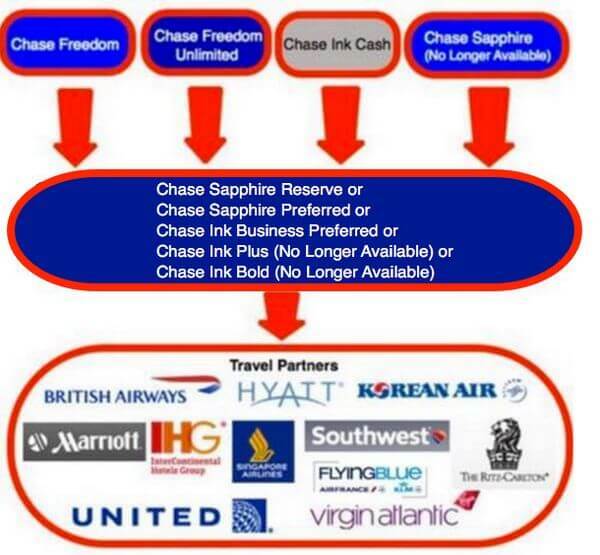 Through the years, it’s changed into the Chase Freedom – so I’ve had the account open 15 years! This is not only my oldest card, but one I use often. I make the most of the rotating quarterly 5X categories – right now it’s restaurants (August 2017), which is awesome. Then, I combine points with my other eligible Chase cards and transfer them directly to airline and hotel travel partners like British Airways and Hyatt. And this is another card with no annual fee. So I’ll keep it forever to help age my other credit accounts! With a free night at a Category 1 to 4 Hyatt every card anniversary, I can easily offset the Chase Hyatt card’s $75 annual fee expense. I used it to book an award night at Hyatt at the Bellevue in Philadelphia. Nights there can easily cost $300+. As long as the free night benefit stays, I’ll keep this card! Here’s another card I’ll keep forever because of a valuable free night perk. I used my free night this year to stay in New York, which can be a pricey place! The annual fee on this card is only $49, so it’s a no-brainer. I pay my monthly cell phone and internet bills to earn 5X Chase Ultimate Rewards points per $1 spent on the Chase Ink Plus (no longer available). I also shop at office supply stores quite a bit, and earn 5X there, too. Because I earn so many valuable Chase Ultimate Rewards points with this card, I’ll keep it for as long as I can. It’s been key to getting free travel in Cancun, around Europe, and all over the US! This card is always in my wallet, so I’m definitely keeping it! Because I often spend on travel & dining and earn 3X Chase Ultimate Rewards points for these purchases. I use it to pay for parking, tolls, and dining throughout the year – those points add up! This card also comes with a $300 annual credit for travel purchases, like airfare and hotels. 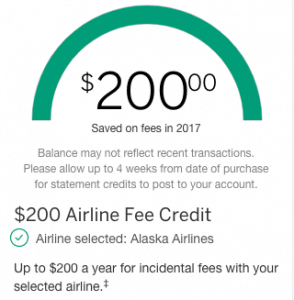 So it effectively makes the annual fee $150 ($450 annual fee – $300 travel credit). And when you pay for travel with the card, you get amazing trip protection benefits. 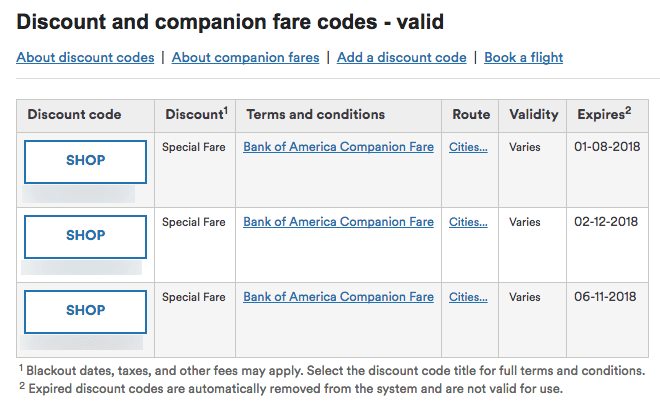 More award seats on United Airlines flights! It’s hard to quantify those benefits. How much is an extra award seat worth? To me, it’s worth a lot. I Love Getting Exclusive Award Seats on United Airlines Because of This Card! This card has a $95 annual fee. But if it’s the difference between taking a trip or not, I’ll keep it. Plus the bonus miles I earn through the MileagePlus X app add up over the course of a year! This card is no longer available. But I sync a lot of AMEX Offers to it via Twitter. And get back 10% of redeemed American Airlines miles each year, up to 10,000 miles. So between these 2 perks, the card is easily worth keeping. This one’s also no longer available. But it earns 3X Citi ThankYou points for online purchases. And when you spend $10,000 on the card in a year, you get 10,000 bonus points. To say I use this card constantly would be an understatement. I probably put the most spend on this card out of all the ones I have! I opened this no annual fee card to take advantage of its stunningly long introductory period. I made a big payment toward my student loan and won’t have to worry about accruing interest until 2019. In the meantime, I’ll save thousands of dollars in student loan interest! This card also has access to Citi Easy Deals, which is handy for buying gift cards at a discount. That’s not a bad setup for a card with no annual fee. And I’m happy about saving so much money toward paying back my student loan! Citi recently discontinued this card. There’s no annual fee, and you earn 10,000 bonus Hilton points when you spend $1,000 each year on Hilton stays. So if you stay a few times, it’s worth paying with this card for some extra points! Plus, it’s free to keep long-term, so there’s no reason not to hang onto it. I get the most savings with the Citi Prestige. That’s because several times per year I take advantage of the 4th night free perk when booking paid hotel stays. Oh How I Love Seeing These Credits in My Online Account Activity! In 2016, I saved over $3,000 with this perk. And in 2017, I’ve already saved more than $500. So continuing to pay the card’s $450 annual fee is a no-brainer. The card also comes with $250 in annual statement credits for airline purchases such as airfare and baggage fees. This is a terrific perk to offset the annual fee expense further. Plus, its trip delay and cancellation benefits are the best of any credit card! So I always charge my airfare to it. This card has rotating quarterly categories to earn 5% cash back. But even better, Discover will match all your cash back earned during the first 12 billing cycles and post it to the 13th billing statement. So you effectively earn 10% cash back in 5X categories the first year! I’ve Earned Over $1,500 This Year in Cash Back From This No Annual Fee Card! There’s no annual fee on this card. And most folks don’t have Discover cards, so you can likely open one easily. If you shop a lot in the 5X categories, which in the past included restaurants, Amazon, and groceries, you can do well with with card – especially the first year. I have 2 of these cards. So I’ll keep one and cancel the other. I downgraded to this from the Club Carlson Premier Rewards Visa Signature® Card to preserve the credit line and history. I no longer care about Club Carlson hotels since US Bank changed the perks on my original card, so I just keep it because it’s free. The Fidelity Rewards Visa earns 2% cash back on every purchase when you deposit to a Fidelity account. But now that I have the The Blue Business℠ Plus Credit Card from American Express, I don’t use it much any more. That said, there’s no annual fee, so I’ll keep it. I’ve had the Icelandair MasterCard since 2005, so it helps to age my accounts. I rarely use it. And I shop at Kohl’s a lot for my Airbnbs. Having a Kohl’s card gets me frequent 30% discounts and free shipping, which I use regularly. It’s not for everyone, but it’s free to have. And if you shop at Kohl’s a lot it could be worth it to save on shipping and have access to more sales throughout the year. Not gonna lie, I got this card for the sign-up bonus. 😉 I’ll keep it for a bit because Barclaycard gives targeted category bonuses throughout the year. So I’ll see how worthwhile it is to keep long-term to earn more American Airlines miles. If they don’t make it worth paying the $95 annual fee, I’ll downgrade it to the no annual fee version. As mentioned, I have 3 Hilton cards and don’t need them all. Although this card earns the most Hilton points per $1 spent, I’m not a fan of the $75 annual fee because the other ongoing benefits aren’t worth it for me. So I’ll likely cancel it next year. This card comes with Hilton Gold elite status, which gets you free breakfast and upgrades when they’re available. That can make the annual fee more than worth it for many folks! But because I already get that perk with The Platinum Card® from American Express Exclusively for Mercedes-Benz, it doesn’t help to have the same benefit on 2 cards. I have 2 of these cards, because Bank of America allows you to have more than one of the same card open at a time. But I haven’t been able to use the companion fares that come with the card, so it’s not worth keeping them and paying 2 annual fees. This one is the same as above. But applying for this small business card doesn’t impact your chances of getting Chase cards in the future. Because the account does NOT appear on your personal credit report! So it could be a nice way to earn miles toward a dream trip without harming your 5/24 status. Citi tightened the rules so you can’t receive a sign-up bonus if you’ve opened or closed a card under the same family of cards within 24 months. So I’ll cancel this card to reset the clock and avoid paying 2 annual fees on similar Citi cards. I’ll cancel one of my Discover it Cash Back cards and keep the other to maintain access to the 5X rotating quarterly categories. I had high hopes for this card. And I’m still a bit on the fence about it. I thought I’d use the 3X mobile payments category a lot more. I added the card to Apple Pay. But have only used it once or twice. And I don’t want to go too far out of my way or change my normal habits just to use this card. The $325 annual travel credit and 12 in-flight Gogo passes per year easily cover the $400 annual fee. After the $325 credit, each Gogo pass only costs ~$6 ($75 / 12), which is a great deal! I need to see if I’ll actually get use from this card. I might end up keeping it. But at this point, I’m leaning toward canceling it when the annual fee is due again. Evernote has been absolutely indispensable for keeping track of them all. Each time I get a new card, I scan the card into Evernote. It takes me a few minutes to add all the details. But over the years, I’ve saved so much time by having this file – I can’t even tell you how helpful Evernote has been by being my digital file cabinet. Remember, you can easily check when you opened or closed a credit card if you want to keep accurate records. The notes sync across devices and platforms. And its note-notebook-notebook stack setup is so easy, anyone can use it. I’ve found dozens of other uses for Evernote. And this notebook is one I access the most. Give it a try if you want an easy way to keep track of your cards! I have 30 credit cards right now – and plan to keep the lion’s share of them. 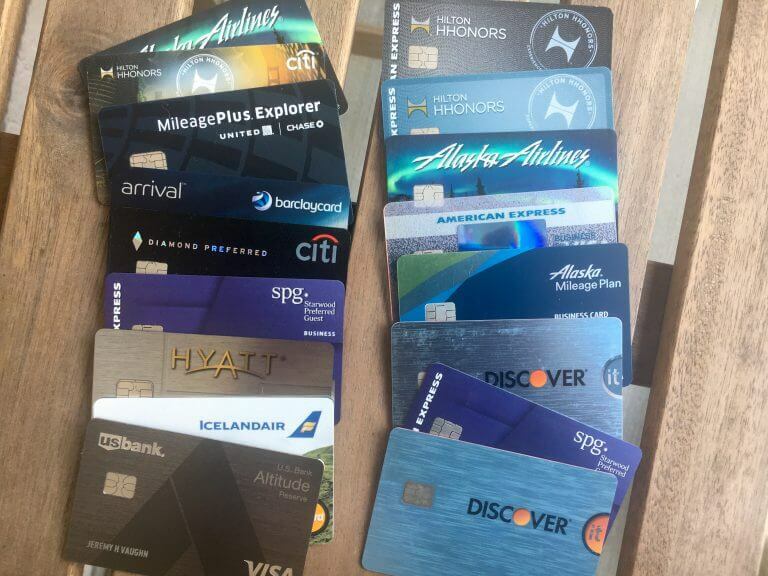 While my annual fee expense on the cards I’m keeping is ~$2,400 (really ~$1,300 after statement credits), I get amazing perks like free hotel nights and annual travel credits with several cards. For example, in 2016, I saved well over $3,000 using the 4th night free perk with my Citi Prestige. Having so many cards hasn’t hurt my credit score. In fact, it’s nearly 800! And I highly recommend Evernote to keep track of everything digitally – especially anything to do with travel, points, or credit cards! These articles are SO valuable to me. Please publish more of your editors’ credit card decisions every six months or so! I love the credit card offers and I love the travel with them, but I think it is important that people really understand some things about it all, especially if they don’t have a lot of fun money to play with. Sometimes I REALLY worry about people getting into this and not understanding a basic about fees. For example the Chase Sapphire Reserve. It was totally worth it to me to get the CSR – last year we got over $2000 in UR to go to Spain, but that fee was not reduced by it. Basically I had $450 in my travel budget and then I bought a bunch of travel for %75 off. If you don’t have $450 in your travel budget then it won’t be a good card for you. Now if you take the cash instead of the miles then you can bring down that fee, even if the overall monetary value isn’t as high. I know many of you understand this, but sometimes I worry enough about those who don’t understand it that I just have to say something. LastPass is also a good (and secure) way to keep track of your credit cards! Everyone should use a password manager if you don’t already! I just downgraded my $95/year Chase Ink Plus to Ink Cash. No annual fee, 5x on cell, cable and office supplies. You can transfer the points 1:1 into Sapphire account. My 2 cents. I definitely exceed the 25K limit so it’s worth it to keep the Plus version and pay the annual fee. But I agree with Rico, if you aren’t spending a lot in the bonus categories, it’s better to downgrade to the Ink Cash. will downgrading count as a new card application, since it’s a different card? With Chase, no. But with Citi, yes.